Over the years I have created several sculptures that have the spring drive mechanism located between the patterning wheels. Each of these sculpture used basically the same type of 3 pawl “fly out” mechanism to power an unpredictable motion pattern. The most recent of this type was Evolution. These sculptures all created patterns I liked most of the time but occasionally the mechanism would deliver too much energy to one wheel or the other making it rotate much too quickly and for too long a period. I’d tried several different approaches to mitigating this “misbehavior” and I think I was most successful with Evolution - but it still wasn’t perfect. I needed to design a new type of mechanism but for years I couldn’t figure it out. This began to change with Monarch I and became a bit more refined with Monarch II. I figured out how to use a multi-pin two pawl mechanism to deliver smaller, more controlled “pushes” and hence to control the motion while still allowing it to create unpredictable patterns. I consider the mechanism in Nautilus the next leap forward in this type of sculpture mechanism. It is much smaller than the Monarch II mechanism and quieter while still allowing me a great deal of control over the motion. It just happened that I had also been working on the perfect set of patterning wheels to go with this new mechanism. 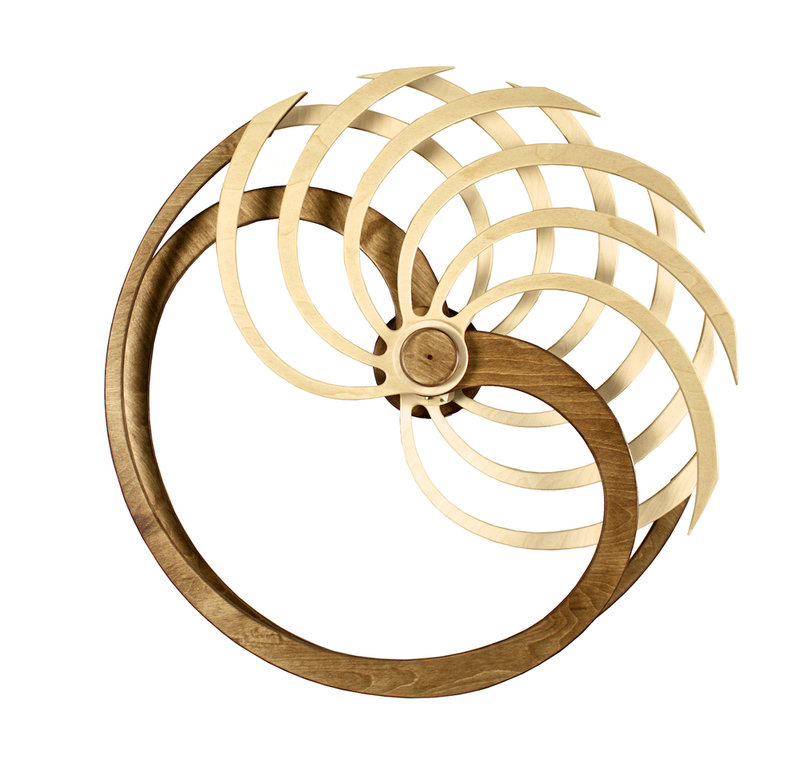 Nautilus has been through several generations as I’ve further refined the mechanism and pattern wheels to work together. Here is a more detailed description of the motion for those that like to study the intriacies of my mechaism in detail. The mechanism triggers when both wheels loose enough momentum to reverse at the same moment. The resulting motion depends on the relative momentum of each wheel at the time of the trigger. For example if the front wheel has more momentum than the back wheel it will transfer much of this momentum to the back wheel combined with a small bit of energy from the mechanism. The back wheel will rotate in 360º cycles and the front wheel will swing back and forth or in the extreme case simply stop. Sometimes the momentum of the wheels nearly matches. In that case the mechanism imparts a fairly equal amount of energy to each wheel setting them both in slow but full 360º rotations. There is a seemingly infinite variety of motion possibilities in between these extremes. Just to complicate matters a bit further the off balance point of the back wheel is constantly changing as the spring unwinds. This means there is a subtle shift in the motion dynamics between a fully wound sculpture and one at the end of its run. I’ve also spent far too much time looking for the right name for this sculpture. The sculpture reminded me of a gentle surf breaking from a peaceful sea but finding a name that expressed that concept escaped me. Jared, my son-in-law suggested Nautilus after a bit of discussion and I knew it was right. The winding of sculptures with the center mechanism and no winding wheel is simple yet not entirely obvious. Here is a short video clip with David demonstrating how to wind Nautilus.